St Helen's church, Trowell with Stanton ironworks in the distance in the 1930s. 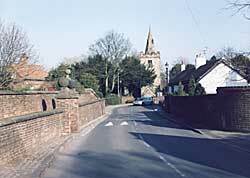 IN the Erewash Valley, rich with wonderful resources of mineral wealth, lies the ancient village of Trowell. Although the small homesteads, with the charming outlook from their windows across hill and dale, have a modern look, ancient associations cling round the parish church and Hall. Who that has studied the annals of the Civil War has not read of the Hackers, an influential county family hereabouts, one of whom, William Hacker, dying in 1668, was buried in the church, where a tablet is erected to his memory? In 1590 John Hacker settled at East Bridgford, and had four sons, one of whom, John, purchased an estate at Trowell from Gervase Brunsley. He died in 1620, and was succeeded by his eldest son, William, cousin of the regicide, and this is he to whom the tablet refers. His descendants continued to reside at Trowell till 1735, when this branch of the family in the direct male line became extinct. The church is dedicated to St. Helen, and has several features of architectural interest, notably an Early English chancel. St Catherine's church, Cossall; the walls of the Willoughby Almshouses (built in 1685) are on the left (A. Nicholson, 2003). Still on the Derbyshire border is Cossall, looking from an elevated site across the thriving and busy valley. In the Middle Ages Sir William de Cossall was appointed a Baron of the Exchequer by Edward III. Another family holding property here was that of Mortem, from whom it passed to the eminent family of Willoughby by the marriage of Sir Richard Willoughby with Isabella, the daughter of Roger de Mortem. The manor also passed into the hands of the Latimers and Skevingtons until the Willoughbys recovered possession. The modern history of Cossall is associated with a famous military hero, Shaw, the Life Guardsman, whose exploits at Waterloo have been so often described in prose and verse. A handsome monument has been erected in the churchyard to the memory of John Shaw and Richard Waplington, of the Life Guards, and Thomas Wheatley, of the Light Dragoon Guards. The two former fell gloriously at Waterloo; the latter, returning home, lies buried in the churchyard. 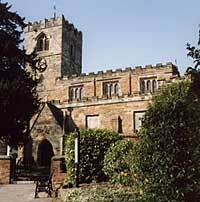 All Saints' church, Strelley, is a splendid 14th century church. The chancel was endowed in 1356 by Samson de Strelley and contains very fine monuments to the de Strelley family (A. Nicholson, 2003). Some two or three miles away, in a well-wooded and picturesque locality, is Strelley, with its fine old ivy-covered church and stately Hall, forming a pleasing picture. Within the church are some splendid monuments of the ancient family of Stradlegh or Strelley, who took their name from the village, and were associated with it for several centuries. As far back as the reign of Henry I. (A.D. 1100-1135), Walter de Stradlegh or Strelley was the principal owner of the parish, and from him it descended to his son Samson, one of the warlike Nottinghamshire gentry who took up arms in behalf of Earl John. This conduct of the representative of the Strelleys, as may be imagined, did not meet with the approval of King Richard, and Strelley was seized by that monarch; but when John came to the throne his adherent was abundantly recompensed for the exactions which Richard had insisted upon. Successive members of the family took part in most of the national events and baronial conflicts of the thirteenth and fourteenth centuries. The Strelleys were called to perform military service against Wallace in Scotland, and one of them, Robert, was made a leader of levies in Notts in 1313, and in 1324 represented the county at a great council at Westminster. After being in the hands of a family whose proud boast it was to have had twelve generations honoured with knighthood, the manor was at length disposed of. Strelley Hall is situated near the church, which was erected about 1356. It occupies the site of the old mansion, and is the seat of Mr. J. T. Edge, J.P., whose ancestor purchased the estate in 1678.